Can you talk a little about your background? How did growing up on a farm in Kansas influence your future career path? Basically, I had a wonderful childhood that was sp­ent roaming in the country on a farm in Kansas. We had rows of trees, a couple farm ponds and a lot of pastures, a big garden, and an orchard. My dad at various times raised sheep and dairy cattle, and he later got into the grass seed business. Just having the opportunity to be outside running around, and using my imagination to think about what life was like in the days of the Native Americans, inspired a lot by our close proximity (two and a half miles) to the historical Waconda Springs, would influence me a lot. By the time I was eight or nine, my dad had begun farming native species of prairie grass near the river next to this historic site, so I ended up spending a lot of time at Waconda Springs. It was a mineral spring that was raised up on this conical mound in the flood plain of the Solomon River Valley, and that formed this large pool with a 60-foot diameter, a unique geological feature in that whole part of the country. In the past, Indian tribes would come over from all over the Great Plains to gather at this place; they considered it sacred. It was intensely concentrated mineral water, mostly sodium chloride. Native Americans thought it to be expression of the Great Spirit and named it Waconda. (Note: to learn more about the history of Waconda Springs, visit https://www.kshs.org/kansapedia/waconda-springs/16720). White people arrived, took over, and claimed ownership of that land. A hydropath from Germany by the name of Dr. G. F. Abraham started a sanitarium there which was used to treat people with this water. Abraham’s daughter was one of the earliest trained naturopaths from Chicago’s Lindlahr College in the United States. Her son, a licensed osteopath, partnered with my father to raise native grass seed at this site, a highly therapeutic mineral spring. I received those treatments myself, and it was quite an overwhelming experience. I look back on that and appreciate the foundation of naturopathic practice. The fact that I was able to be so close to where it was practiced in Kansas, of all places, is remarkable to me. That whole experience of growing up in the country, close to nature, has become even more important to me for health and wellbeing. It’s especially important in regards to mental health as it applies to so many young people today in our modern world. We’re all so attached to these electronic gadgets; people are so plugged in that very often they are really deprived of all of the advantages of spending time outdoors and in nature, and not being consumed by information overload. We used to enjoy a lot of what people have cultivated for millennia – input from nature, experiencing bird song and green plants and all that. There is a man who was a graduate of my alma mater, the University of Kansas, Richard Louv. He wrote a book called Last Child in the Woods – Saving Our Children from Nature-Deficit Disorder. It unfortunately describes a lot of the problems that many people, not just children, have with their health today. We are a step removed from natural surroundings and experiences. Those things tend to have a very calming effect in general. Our challenges today are in terms of a mental survival, peace of mind, and that aspect, I think, can’t be overemphasized in our modern world. The need to spend more time outdoors, relaxing and enjoying the natural world, was a foundational element for me and my early experience that led to my appreciation and desire to share that. I spend a lot of time looking up scientific and medical journal articles online and reading them, trying to digest them and extract information on botanical medicine that can be shared with doctors. I am updating a book I wrote on herbal and drug interactions, which is a topic of great interest in the medical field today. In 1997, with the support of Ed Alstat, I was the first one to publish a book on this topic; the most recent version from 2010 is entitled: Herbal Contraindications and Drug Interactions: Plus Herbal Adjuncts with Medicines, 4th Edition. On the Eclectic Institute site, I make periodic updates that are free for anyone to obtain on the Eclectic Institute website. There are now around 3,550 references; I have added 850 more since the 4th edition of the book was first published. There has been a great growth in interest and research into this issue of interactions between drugs and herbs. That was instigated by people who were suggesting that there were unacknowledged and unrecognized instances of herbs interfering with drugs, either adding to or antagonizing their effects. Natural substances, including foods, can affect the metabolism of drugs. A drug is broken down in the body by liver enzymes. Certain herbs have the capability of increasing the rate of that breakdown, inducing the metabolic enzymes – the poster child for that is St. John’s wort. The result of that is that if you reduce the amount of a drug circulating in the system, people could suffer from having an inadequate amount of medicine circulating. Another effect is if the herb or food would inhibit the enzyme. For example, grapefruit juice tends to lead to a buildup of the drug in the system, with the potential of causing toxicity and increased side effects. So, there is good reason for interest in that area based on the serious nature of these interactions. I attended a pharmacy convention in Texas during the mid-1990s. Pharmacists indicated to me that they sold herbal products and were concerned about possible interactions. That is what led me to begin and to continue this study. It has been pretty well documented that a few herbs have clinically significant interactions with drugs – gingko, St. John’s Wort, goldenseal. In addition to those herbs there are foods such as grapefruit and vegetables in the cabbage family. Research has really narrowed the focus of significant interactions, but there are many herbs that haven’t been tested. Studies continue; until something has been studied in humans, it’s uncertain as to whether there is a real interaction or not. Earlier research was done in test tubes or on animals, and those results can’t be automatically extrapolated to human beings. Prior to starting all that, most of the time I have spent in compiling research to document the activity of medicinal plants and to show that scientific research indicates how they are indeed active. Providing evidence for traditional applications based upon our current knowledge of pharmacology is the focus of my work in general – scientific medical research on herbs, and specifically, the work on interactions with drugs. Can you talk about your history and work with Ed Alstat and Eclectic Institute? I met Ed when we were both freshmen at the National College of Naturopathic Medicine (NCNM). While we were working towards a human biology degree at Kansas Newman College in Wichita, I had previously studied plants and botany, and I had an interest in many of the applications. I had done some self-study on herbalism. Ed also had a very strong interest in medicinal plants. We spent a long time looking at various local plants and discussing herbs. Ed had always been interested in developing health products using modern technology. He really saw the importance of effective and good-quality health products from natural sources, in particular with applying the technology of freeze-drying to plants. He was very much into that after his clinical experience. When we graduated, he went to work in Cannon Beach, and I stayed at the NCNM teaching clinic. The pharmacist quit, and the clinical director, Dr. Michael Ancharski, wanted to put me in charge of the clinic dispensary, or, natural pharmacy. I convinced him that Ed would be much more qualified than I. So, Ed took the position at the teaching clinic. Dr. Ancharski wanted Ed to develop a prenatal multivitamin to give to his patients. The first product, the beginning of the Eclectic Institute, was the Opti Natal multivitamin for pregnant women. From there they developed ideas about other products combining herbs and vitamins and minerals. Ed went forward with a lot of the botanical products we discussed when we were students, focusing on the importance of using fresh plants to make botanical extracts. Most extracts then were made out of dried plants and were of relatively poor quality. After making liquid extracts of fresh plants, Ed initiated the application of freeze-drying to fresh plants so you could get fresh quality plants in a dried form. That was the beginning of Eclectic Institute. Ed was working in the teaching clinic dispensary of NCNM and while Dr. Ancharski was the director of the clinic, they reached an agreement to use the spare space at the college for an office and manufacturing. The college gave Eclectic Institute an endorsement of their products, while the company paid the college a percentage of its gross sales; it was a win-win situation. Eventually, Eclectic Institute moved out to Sandy, and NCNM moved from Market Street to its location in downtown Portland. My official title is consultant in research and development; that means I am mostly an idea person. One of Eclectic Institute’s earliest products, which was one of the few that I formulated myself, was a topical application called CCC Cream - Calendula Comfrey Coneflower. It’s one of the best-selling and most effective products. But for the most part, I just give opinions about different formulations. I make suggestions and try to find supportive evidence. My books are published through Eclectic Medical Publications, and are available there in hard copy. My last two books are also available in Kindle format at Amazon.com. One unique feature about Kindle Books is that you can adjust the size of the page for small or large print. Herbal Contraindications and Drug Interactions: Plus Herbal Adjuncts with Medicines, 4th Edition is formatted with pagination. The index is a massive part of the book in which things are cross-referenced with each index page number linked to the indexed text. In the 4th edition, I created a whole new category called Herbal Adjuncts. Evidence shows that by combining certain herbal products with certain medicines for particular conditions, you can get enhanced clinical outcomes. The index is formatted with conditions underlined to show whether there are advantageous interactions. So, with a listing of a certain herb or drug or beneficial interactions between herbs and drugs, you can click on the page number and it links to all those pages. Accessing the information is very easy. Also, in the Kindle version, there are links to the free online updates. We will continue to update the herbal adjuncts of drugs, drug interaction, and contraindication aspects to this book. There’s always a growing body of research on herbs and their activities. That is a very large piece of work that requires constant vigilance and updating, so it’s an ongoing task. In accordance with the Dietary Supplement Act of 1994, I research structure and function claims for Eclectic Institute health products. Dietary supplements include herbs, so if a product is going to make a claim that it benefits heart health or supports kidney function, you have to be able to provide human evidence that those effects actually exist, and find scientific and medical studies. All of that has to be substantiated scientifically. I help to compile and summarize research for those different types of claims for different products. Finally, I will continue something I have been working on for 20 years – a book that’s based upon the ethnobotanical history and modern medical and scientific studies on the development of Native American medicinal plants. I have focused on a few dozen, some of the major herbs that are familiar and some others that are obscure. So what I’ve done is look back at indigenous American herbs which were used by a lot of doctors in the 18th, 19th, and 20th centuries, and at traditional American medicine, which also used herbs and herbal preparations as part of their practices. Then there was the development of 20th-century naturopathic medicine. Early research has come out of Europe that shows the historical uses of these Native American plants and their components are being verified and even expanded upon by scientific and medical studies. I try to look at each plant as its own story; it has a natural history and scientific development native to North America, and its use has been not only consistent but expansive. Distribution and application has grown throughout the world. What used to be North American remedies are now worldwide medicinal agents. 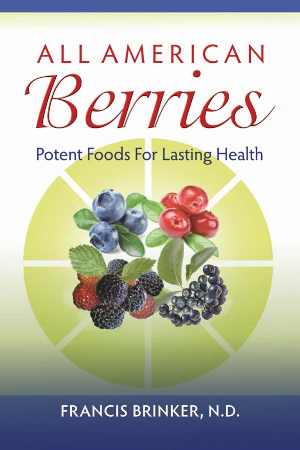 This is a work in progress; my book All American berries was actually developed as an appendix to this book. It grew so large we decided to publish it on its own in 2015. Is there greater acceptance of herbal and naturopathic medicine in Germany and other European countries? It’s part of their medical tradition. Every country except the United States has an indigenous medical tradition that goes back consistently to prehistory. The Europeans have, to a much greater extent, maintained their traditions. Most of the population in America comes from somewhere else, so we’ve largely abandoned those medical and herbal traditions that were part of the cultures of the immigrants land. Of course, Native Americans are in a completely different situation. Their cultures have been so suppressed that the handing down of that culture, as regards most of the knowledge that applies to medicinal herbs, has been lost or transformed in ways that are no longer entirely recognizable. Its application also tends to be limited to their own population and cultures, not widespread or expansive. Herbal medicine as practiced in the United States is a more recent phenomenon, of the last 200 years. Most of the modern research is done in other parts of the world. In the United States, it has been largely suppressed for several generations because on the synthetic pharmaceutical industry which has tried to eliminate competition. There’s a great disincentive to invest in herbal research; these medicines cannot be protected by patent rights since they are natural products. Once a natural product is proven to be effective, anyone can manufacture it. So, a lot of reasons for neglect of herbal remedies are political, based on how our medical system is run. In Germany, and especially in China, the standard approach to medicine tries to incorporate traditional medicines into modern clinical practice. It applies modern scientific principles to studying traditional medicine and utilizing it beneficially and in combination with modern synthetic pharmaceuticals. The same is true to some extent in India and Iran. These ancient and traditional cultures which have sent many young people to American medical schools are now trying to incorporate the Western model of modern medicine together with their traditional practices. The United States is way behind many of these ancient traditional cultures in Russia, China, Western Europe, India, and Iran in this regard. Our exchange of research information and herb uses has largely been through Germany and France, mostly with Western Europe countries where they have used American herbs. Modern medical use of these herbal products has arisen out of that research, whereas in the United States, phytopharmaceutical medicine is treated as dietary supplements – we can’t make any therapeutic claims. It’s a real dichotomy that exists between America and the rest of the world, with how the use of herbs for health is accepted and managed. I would say, the best message for everyone is that many of the limitations and problems we have now are readily apparent and identified. Everything addressing quality is growing and improving and we can look forward to a continuation of that. Herb use continues to grow. People are more aware of advancing their own health, and are taking personal responsibility for it. They are wanting to use natural products instead of drugs. I think there’s going to be an ongoing increase in the development and use of all these things – combinations of herbs, minerals, natural remedies. There are good reasons for a degree of hope for the future and the health of our country, and especially with regard to our being able to apply ourselves to knowledge we have acquired through modern research and study and knowledge of traditional practices. There are reasons for optimism on a lot of other levels. People have an interest in going back to nature and learning how natural remedies can be applied to what we are confronted with in our modern world. Dr. Brinker's "Herbal contraindications and drug interactions"